It’s been almost 2 years since I originally wrote this blog post but watching the World Cup 2014 prequarter final filled with additional time, penalty shoot outs and the possibility of a death round in the Brazil vs Chile match and then again in the Argentina vs Switzerland match, I started to think, these teams are all a flock of successful birds with the goal of winning and making it to the finals. As I watched the games, I started observing their strategies and game plan and how it could all go wrong for a team that looked like it might win only to have 1 goal change the scenario. Messi’s late goal against Switzerland and the Dutch comeback in the 88th minute of their game are good examples. I thought about the DOPE test and it occurred to me that each team actually had variants of each behavioural profile depending upon the circumstances. The first time I heard the word DOPE for behavior profiling, I thought, you’ve got to be kidding; do they mean people are junkies? Just kidding! In fact DOPE or Dr Gary Couture’s bird version of behavior profiling is quite popular since it immediately creates a visual object. In this case the four basic personality types are Dove, Owl, Peacock and Eagle which I personally prefer as a description over DISC (Dominant, Influencer, Steady and Compliant) since one can visualize the character and behavior traits by simply thinking about the bird in question. The kind of avian that describes you has a lot to do with how you handle life and the motivators required to help you achieve your goals, just like the Body Code which helps you to lose weight and maintain optimum fitness. Success ultimately comes down to you and how you handle the execution of your goals. Would you like to find out your Bird Type? Have a go and then read on to find out your type and the suggested Goal Setting Tips for your behavior type! The word Dove immediately conjures the vision of a gentle, friendly and peaceful person. In fact, Dove people make for great team players, love to help others succeed, make friends and network easily and give more than they receive. The downside of a Dove is that they have assertiveness issues, are averse to risk-taking, can get pulled into other peoples goals, avoid confrontation and put others before themselves. Play on your strengths as a people-person and team player. At the same time, think more about what you really want for yourself and set your goals accordingly, not because someone says that a particular goal is good for you. A good personal development goal would be Assertiveness Training. The human Owl, like the feathered counterpart conjures the image of a wise, meticulous and logical person, great at detailed work who thinks things through thoroughly. Curious by nature and motivated by knowledge and logic, Owls enjoy gaining knowledge and becoming experts in their field. They can sometimes be perceived as perfectionists. The downside of an Owl is that they can be inflexible taking forever to plan rather than execute. Perfectionism is a problem for them and like the Dove, not great risk-takers. Goal Setting Tips for Owls Try stepping back and seeing the Big Picture rather than getting lost in the details. Set goals that make you step out of your comfort zone and challenge you to acquire more skills and knowledge and reach your potential. When setting goals, set your long term goals and then focus on those mini-goals that help you to achieve milestones towards the bigger life changing goals. Try to let go of your need to be perfect. It is alright to be human and make mistakes! When it rains, the Peacock opens up its tail feathers and dances. 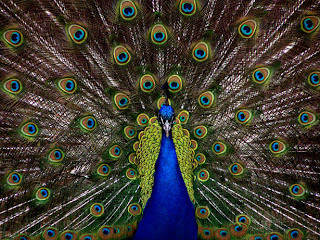 Likewise, the Peacock person is said to be a charismatic leader, enthusiastic, optimistic and passionate. They are known to be people-oriented although not very good with detail or time management and may even be accused of talking too much or seeing only the big picture and losing interest when faced with roadblocks in goal achievement. Goal Setting Tips for Peacocks Use your natural enthusiasm and passion to motivate others to work with you on achieving your goals. Having visualized the big picture, identify the main and specific goals that you need to achieve in order to realize the big picture. Prioritize your tasks and goals. Do take advantage of opportunities and challenges that you come across but be discerning in your choices and make sure that you use your time, energy and resources on those goals that make your big picture goals achievable. A natural achiever, the Eagle is independent, highly focused, motivated and driven. Not one to give up easily in pursuit of the goal, the Eagle is a risk taker and not afraid of failure. Of course, no Eagle likes to fail but they have the capacity to see failure as a chance to bounce back and often surprise others around them. The Eagle’s downside is that they can choose goals on impulse lose sight of the big picture and get bored with details which affect their planning. They may come across as being dominating, insensitive and inflexible. Keep sight of the big picture and don’t get lost in goals that do not help you achieve your ultimate goal. Take time to plan out your actions and be flexible. It sometimes helps to have a Plan A and a Plan B. Practice being sensitive to others, particularly if you are part of a team. Knowledge of behavior profiles helps to set goals that are more likely to be achieved since we are taking into account the personality of the goal setter. More often than not, our profile matches more than one behavioral profile which might also explain why we react differently under stress and pressure. The next time you are engaging in goal setting, try looking at yourself and your strengths and weaknesses from a BIRD perspective. It might just help with success in goal achievement. What did you learn about yourself? Are you a true blue Dove, Owl, Peacock or Eagle? Noticed any combination? Do share your observations in the comments box below, I’d love to read your feedback! PS. Want a copy of the DOPE Test? When you buy my Kindle book Goal Achievement Simplified, you also get access to a pdf copy of this assessment as a gift.